The meddyEvils came from this art school generation with Roy Roberts and Tony Benson taking the creative and musical lead. The art school musicians enjoyed blues, R&B and modern jazz and it was this fusion of interests that shaped a lot of the music. One period in particular has stood the test of time, 1965-1966, when a certain genre of 'British' music – named rather strangely – 'Freak Beat' – e.g. Brit Garage was born. Records released in this time frame are collectable and can be found on collectors CD compilations (and old vinyl LP's) worldwide. The typical sound very often had a Hammond organ through a Leslie speaker cabinet in the mix; R&B mixed with a jazzy feel was the benchmark. 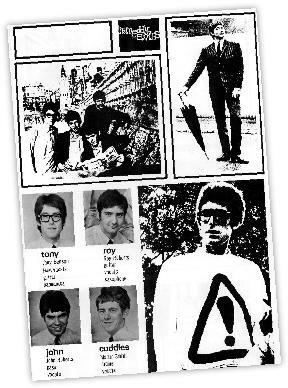 This website was set-up by myself in response to some meddyEVIL sleeve notes that stated "very little is known about this band from Southampton but they certainly got things right by the fact that their singles now change hands with collectors at over £100". If you have more information to fill in some of the details, drop me an email.